Without a doubt, the majority of seniors would prefer to age in place. Our homes frequently carry a lifetime of happy memories that bring us joy and comfort. Aging in place is not without its challenges, though. Health or mobility concerns can make it more difficult to meet the demands of performing household chores and daily living activities. If you or a loved one have begun feeling like you need a little assistance, a home care agency could be the key to meeting your needs while remaining in the home you love. 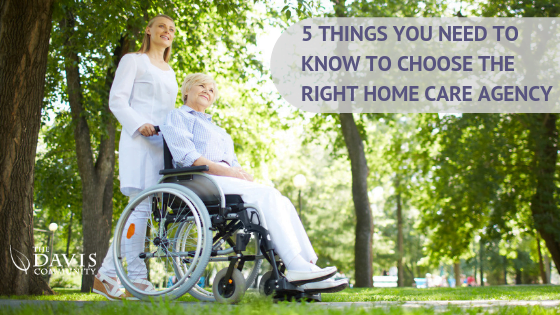 Choosing the right home care agency is a big decision. The following 5 tips can help you to find the agency that’s right for you. A home care agency can provide a wide variety of services. Before you begin your search, it is a good idea to determine exactly what kind of assistance you need. For example, do you need help with house cleaning, laundry, and meal preparation? Will you need someone who can provide assistance with bathing, dressing, or other aspects of personal care? Are you looking for transportation to doctors appointments or to run errands? Do you have medical needs, such as medication management, blood pressure monitoring, or therapy? Do you need a caregiver who is available around the clock? Is there a possibility that your current needs may change down the road? A home care agency should be able to provide you with references. But you may be able to narrow your search by asking for recommendations from trustworthy sources. Since your doctor is well aware of your medical needs, he or she may be able to recommend an agency that will give you exactly the kind of assistance you need. Another reason to involve your doctor in your decision is that there may be a need for him or her to communicate with your caregiver. You could also check with your local Agency on Aging to find out what services are available in your area. If you have a friend or relative who has been satisfied with their home care, it may be worth looking into whether their agency would be right for you too. You will want to find out exactly what costs you can expect to encounter. In addition to the cost of the care itself, ask if there are any additional deposits or fees. Ask how often the agency bills for care and whether it will bill your insurance company directly. If you are covering any of the cost of your care, find out if there are options for reduced fees. There are several options when it comes to paying for a home care agency. If you have purchased long-term care insurance, it should assist you in covering the costs. Medicare and Medicaid may cover some services, but you would have to meet certain criteria. Some have chosen to use a reverse mortgage or a life insurance policy to help pay for home care. It may be best to talk to a financial adviser if you are considering either of these options. You may also be able to learn about programs that you qualify for through websites such as eldercare.gov and benefits.gov. For more tips on paying for long term care, check out this resource from AARP. The people providing your services will become a big part of your life. Thus you’ll want to make sure that you are comfortable with them. Having a chance to meet the individuals who will be providing your care ahead of time will give you that opportunity. If it’s important for you to have the same person providing your services, you’ll want to know if the staff rotates. Ask what happens if your regular caregiver isn’t available. You’ll also need to know if they are qualified to provide the care you need. For example, if you need occupational therapy, do they have therapists available? Are they licensed and insured? Your safety is very important. With that in mind, ask if the agency conducts background checks on its employees. In the event that you are not satisfied with the services that a caregiver provides, you may want to ask what the policy is on resolving complaints or requesting someone different. Find out how long the agency has been in business. Verify that it is licensed by the State and that it meets federal requirements for health and safety. You may also want to know whether it is inspected by an outside organization and if there is a recent report available. Check with the Better Business Bureau to view their rating and see any filed complaints. You’ll also want to ask who is involved in creating and reviewing your personal plan of care. Do they involve clients, family members, and healthcare providers when necessary? Find out how often and by what means the agency or staff communicates with family members who may need reports of caregiving services provided. Choosing the right home care agency is a big decision, and you’ll likely have a lot of questions and concerns. Click here for a comprehensive checklist of questions you may want to consider asking your prospective home care agency. This entry was posted in Assisted Living, Rehabilitation. Bookmark the permalink.